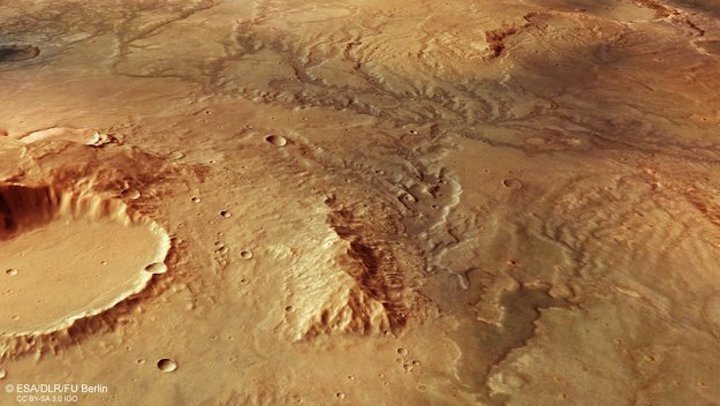 These images from ESA’s Mars Express satellite show a branching, desiccated system of trenches and valleys, signs of ancient water flow that hint at a warmer, wetter past for the Red Planet. We see Mars as a cold, dry world, but plenty of evidence suggests that this was not always the case. Research in past years instead increasingly indicates that the planet once had a thicker, denser atmosphere that was able to lock in far greater amounts of warmth, and therefore facilitate and support the flow of liquid water on the surface below. While this is no longer the case, we see clear signs of past water activity tracing across the martian surface. This image shows one such region: a system of valleys in the southern highlands of Mars, located east of a large, well-known impact crater called Huygens and north of Hellas, the largest impact basin on the planet. 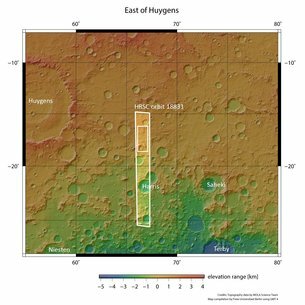 At 3.5 to four billion years old, the southern highlands are some of the oldest and most heavily cratered parts of Mars, with many signs of ancient water flow observed here. The topography of this region suggests that water flowed downhill from the north (right in the main colour, topography and 3D images) to the south (left), carving out valleys up to two kilometres across and 200 metres deep as it did so. We see these valleys as they stand today, having undergone significant and heavy erosion since they were formed. This erosion is visible in the form of broken down, smoothed, fragmented and dissected valley rims, especially in the valleys cutting from east to west. While it is unclear where all of this water came from originally – precipitation, groundwater, melting glaciers? – all of this required a far warmer and more watery past for Mars than the planet we see today. A tantalising question raised by this warmer and wetter climate is whether conditions would have been suitable for life – a topic at the heart of Mars exploration. Next year, ESA and Roscosmos will launch the ExoMars mission comprising a rover – recently named Rosalind Franklin – and a surface science platform. The rover will drive to interesting locations to drill below the surface in search for signs of life – the first mission of its kind. Meanwhile, the ExoMars Trace Gas Orbiter continues to analyse the atmosphere in greater detail than ever, with a particular interest for gases potentially related to biological or geological activity, and to identify subsurface locations where water-ice or hydrated minerals are present. This succession of spacecraft at Mars – both in orbit and on the surface – ensures ESA’s long-term presence in Mars science and exploration. The next step that ESA together with international partners are considering is returning a sample of Mars to Earth – an ambitious task that will provide scientific treasures for generations to come.